Take The Escapist's Apocalypse Lane Series Finale Quizzes! It's lights out on Apocalypse Lane's last little Cul-de-Sac in the world this week, and to give Cuddles and the gang a proper sendoff, we're treating you all to a pair of quizzes - and there's a badge at stake. 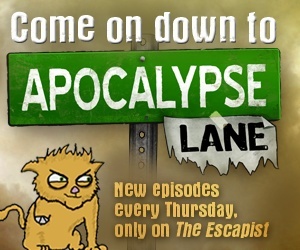 Apocalypse Lane first debuted here on The Escapist almost a year ago - and 48 episodes later, we're going to be very sad to see the adventures of Cuddles, Steve and the rest come to an end. But if we're going to send them off, we're going to send them off in style - and that means kicking off a week of Apocalypse Lane goodies with two (count 'em, two - one less than Cuddles' legs) quizzes! If you've only been watching the series recently, you might want to take our Normal quiz, which features questions pulled only from the second season. If you've been watching since the beginning, though, test your luck at the Impossible quiz, and get yourself a shiny new Apocalypse Lane badge! C'mon everybody, sing along with me! You'd live on Apocalypse Lane?